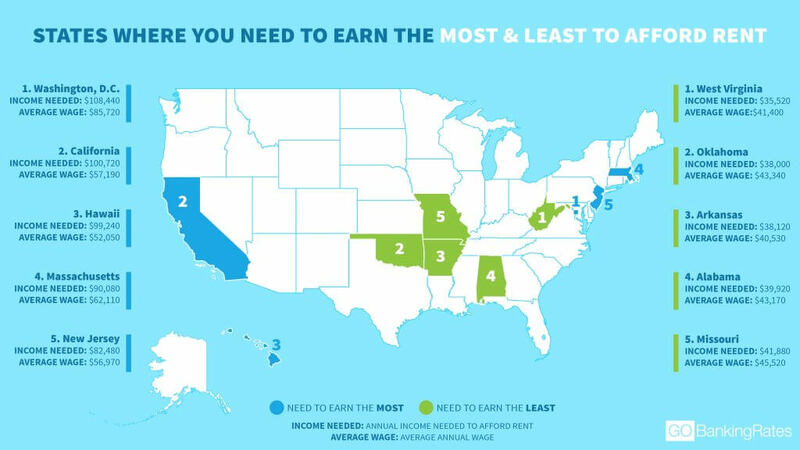 Are you earning enough to afford rent in your state? Households that spend more than 30 percent of their income on housing are cost-burdened, according to the U.S. Department of Housing and Urban Development. Unfortunately, nowadays, most Americans spend well beyond 30 percent of their income on rent — and there are few signs indicating this will change for the better anytime soon. GOBankingRates conducted a study that determined the salary required in every state to maintain the “30 percent of income” rule of thumb, based on 2018 rent data from Zillow and mean annual wages from the Bureau of Labor Statistics. The results of this study paint a gloomy picture of affordability in the U.S.
Where You Need to Make at Least $100K to Afford Rent: California and Washington, D.C. If you’re asking yourself, “How much can I afford?” be prepared for some disheartening news. One of the study’s most distressing discoveries is how inadequate incomes across the country are to cover rents. In fact, there are only 11 states where median rent costs consume 30 percent or less of income. There are two places — California and Washington, D.C. — where you need to earn at least $100,000 a year to afford the median rent. Based on median rents of $2,518 in California and $2,711 in Washington, you’d need to earn nearly $8,400 a month to afford the former and over $9,000 a month to afford the latter. California and Washington are the only two places in the country that require six-figure incomes. Affordability, however, is all relative. Although the salary you need to afford rent in some states is much lower than in others, that doesn’t necessarily mean it’s more affordable. Take Colorado, for example. The wage you need to afford the median rent — $77,080 — is much less than Washington’s $108,440 a year. But in Colorado, the $23,030 gap between the salary you need and the state’s actual annual wage is larger than Washington’s gap of $16,040, which undermines its affordability. Colorado is just one of 40 states where the average annual incomes fall below the required threshold to afford rent. That means there are 11 states where the average income exceeds the amount you need to afford rent. The study highlights a continuing issue in recent years of wages not keeping up with rising living costs. On top of this, across the U.S., the supply of available houses to buy is low, pushing up home prices. With nearly four-fifths of U.S. states rent-burdened, HUD’s definition might be up for revision. The good news is you can always find pockets of affordability, though it requires persistence and knowing what you want. One of the first choices you need to make is whether you’re looking to rent or own your home. Click through to find out if it’s more affordable to rent or own a home in your state. All information is accurate at the time this study was conducted in July 2018.